Holds 5 pairs of eyeglasses, easy installation and good portability. A convertible and practical display solution for sunglasses and glasses. 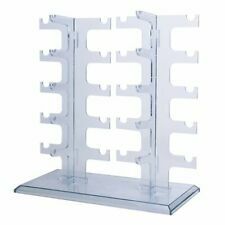 5 pairs glasses stand holder display. Suitable for counter display. 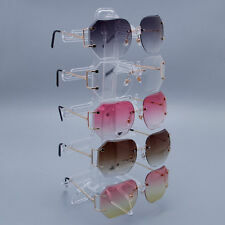 sunglasses rack sunglasses holder glasses display stand Description: eyeglass holder display Looks very stylish and elegant Easy installation and good portability Holds 10 pairs of glasses Ideal for counter / table top use base size (L x W): ca.12,2 x 5.5 cm / 31 x 14cm height: ca. Fits just about any type of pegboard or slatwall and will give you years of service. 0.148" Zink Plated. When You Think of Pegboard. Fits just about any type of pegboard and will give you years of service. 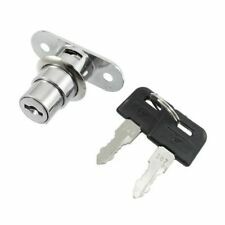 Available with Optional Locks to Secure Hook onto Pegboard. Maximum load: 2 kg load. The big one is USB load 2 kg, other solar products. Solar rotating display stand with blue LED lights, lighting and rotation, very charming. The product works normally under natural light and is automatically rotated for two-way 360-degree display. 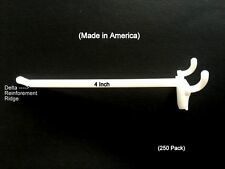 Holds 5 pairs of eyeglasses, easy installation and removable, good portability. Holder only,Glasses not included. Suit your needs perfectly! 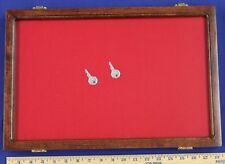 1 x Sunglass Holder,2 x Screws,1 x Bottom,10 x Crystal Pins. Perfect for organizing, holding and displaying sunglasses, eyeglass and othe glasses. - Height: approx. - Size: approx. - Material: Resin. 3, The port has been specially processed to make the hook more beautiful. corrosion-resistant, and more durable;. Color: Silver. Finish: Polished. We will try our best to reduce the risk of the custom duties. 10x Pouches. - Perfect for organizing, holding and displaying sunglasses, eyeglass and othe glasses. 1x Display Rack. The Rack isNOT Rotatable. - Stand Material: Natural Wood. - High Quality and natural wood material. 1 x DSO138 Transparent Acrylic Sheet. Color: Transparent. Material: Acrylic. 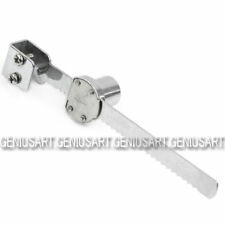 Installation size: 12.7 x 8.7 x 2.6 (L W H). They are easy to install and lock into the pegboard for stability but are easy to move, no more loose or wobbly pegs falling on the floor. 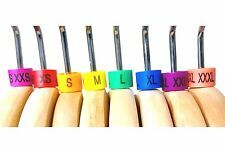 ® J Style Pegboard Hooks. J Style Pegboard Hooks. 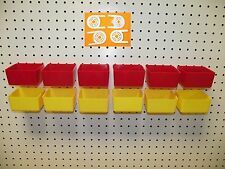 Fits all Standard ¼ in pegboard. 1 x Essential Oil Wooden Stand(30 Grids). 1 x Essential Oil Wooden Stand(12 Holes). - Lightweight and compact, making it easy to transport your oils wherever you go. - Made of high quality natural wood, durable and no odor. 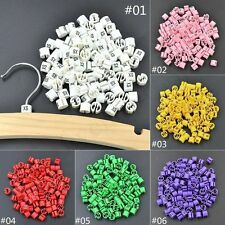 100 Pc - Pegboard hooks. Fits just about any type of pegboard or slatwall and will give you years of service. When You Think of Pegboard. Steel Ball Tip end for safety. Lot of 100 Black 2 Inch Slatwall Gridwall Hooks Retail Display 2"
Slatwall Hooks Slat Wall board Shelf Shelving Lot of 20 pcs New 4" x 1/4"